Whewwww! What a weekend! I tried to use scraps whenever possible except on the last card which I made for my sis and her husband. I really had to push myself when I was creating the "thick" card. Critter Love was a card in process that needed a sentiment; inspiration came from a stamp and a lack of O's stickers. 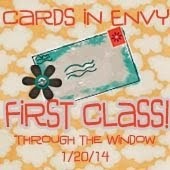 If you have any questions about any of the VCMP cards just shot me an email. Hope you were an inspired as I was! 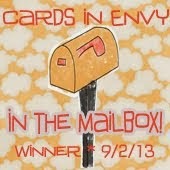 I love all your cards, but my favorite is the Sketch #232 card! Great job!! I see someone else was busy making cards this weekend too! They're all fantastic, and I scrolled back to see them all! I just love the "miss you" card with the footprints embossed in the background! Thanks for reminding me to use that folder more often! Well done on each one!! So proud of you for finishing all the challenges. I have a few left to go. Maybe I'm partial, but I really like the card you made for my Teen Time challenge the best. All of them are sure to bring smiles to the recipients, though, and that's the best part of all!! Oh wow! You did great completing all of the OWH VCMP challenges! Huge congrats to you! Thank you for taking my challenge for the furry critter love card! Your background looks like a quilt to me. Great job! You're going to make a lot of people happy! It's great to see you use the bicycle stamp in different ways. Great cards! Thanks for participating in my Thick & Thin Challenge! Really like your design and red white & blue is always good choice!